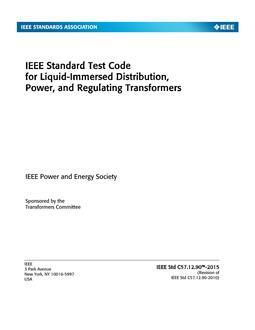 This guide applies to mineral oil used in transformers, load tap changers, voltage regulators, and reactors. The guide discusses the following: a) Analytical tests and their significance for the evaluation of mineral insulating oil. b) The evaluation of new, unused mineral insulating oil before and after filling into equipment. c) The evaluation of in-service mineral insulating oil. d) Health and environmental care procedures for mineral insulating oil. e) Methods of handling and storage of mineral insulating oil. The characteristics of the mineral oils discussed in this guide do not include reclaimed or reconditioned oil installed in new equipment. The qualities of such oil, if used, should be agreed upon by the manufacturer and the user of the equipment. Revision Standard - Active. 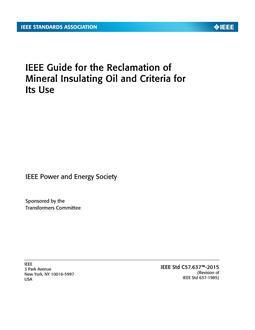 Recommendations regarding mineral oil tests and evaluation procedures are made in this guide; references are made to methods of reconditioning and reclaiming conventional petroleum (mineral) dielectric insulating liquids; the levels at which these methods become necessary; and the routines for restoring oxidation resistance, where required, by the addition of oxidation inhibitors. The intent is to assist the power equipment operator in evaluating the serviceability of mineral oil received in equipment, oil as received from the supplier for filling new equipment at the installation site, and oil as processed into such equipment; and to assist the operator in maintaining mineral oil in serviceable condition. The mineral oil covered is used in transformers, reactors, load tap changers, and voltage regulators.